A couple of weeks ago I mentioned that I was working with my third graders on fiction summaries. I am very pleased to say that they have made a lot of progress! Unfortunately, that is only half the battle. Now, we must master nonfiction summaries, too! Does it ever end?! 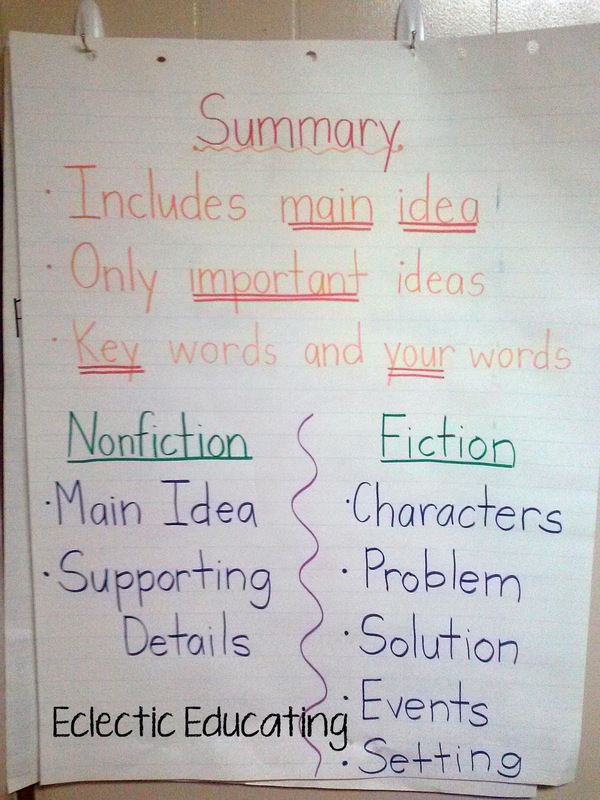 We used the same anchor chart, but focused on the nonfiction side. 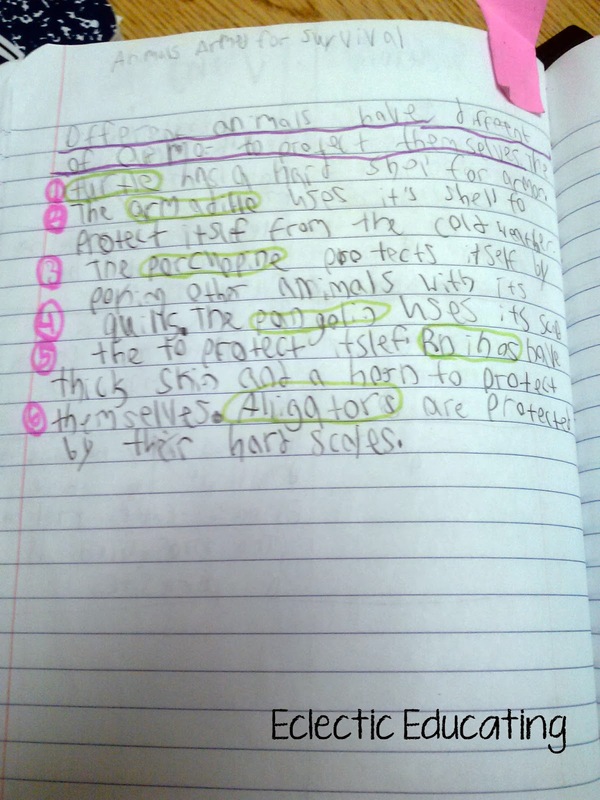 A nonfiction summary focuses on the main idea and supporting details. Finding the main idea can definitely be tricky. The only way to get better is through lots and lots of practice! For the first book, students analyzed my model of a nonfiction summary. 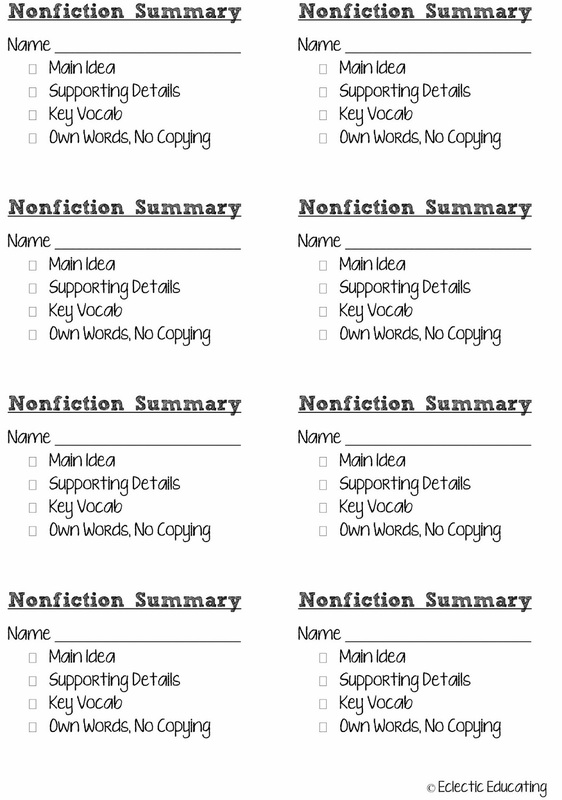 Since the checklist worked so well for fiction, I made one for nonfiction, too! Students used crayons to mark up my summary. When they found something from the checklist in my summary, they either underlined or circled it and checked it off. We wrote the second summary together through guided practice. Once again, we used the checklist to analyze and mark up the summary when we were finished. For the final summary, students wrote the summary independently. They self-assessed their own summary using the checklist, then they traded with a partner. The partner then used the checklist to grade their summary. I love how the checklist allows students to be more independent. They can just reference the checklist instead of asking me for help. 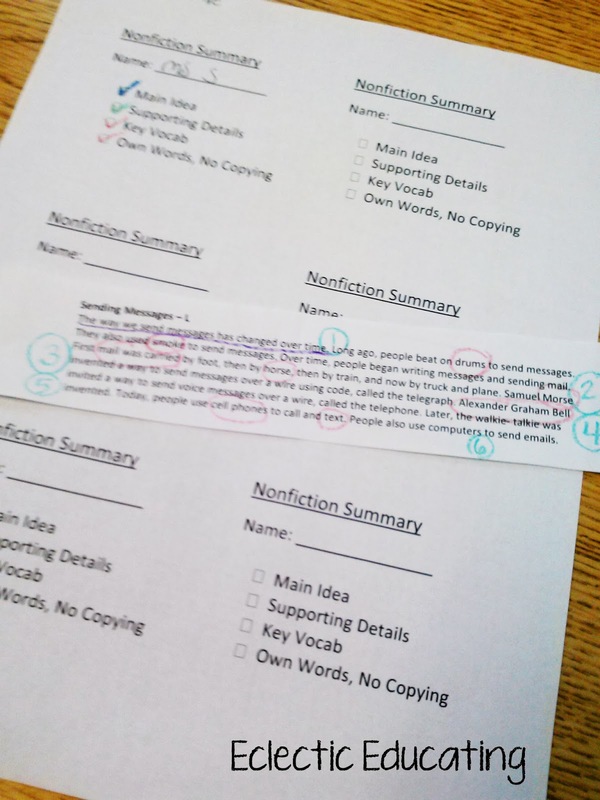 The constant assessing of my work, their own work, and other students' work provided constant repetition and reinforcement of the elements of a good nonfiction summary. We will continue to practice, and hopefully students will retain this information! If you would like your own copy of the checklist, click here. Do you use checklists in your classroom? So helpful... systematic and simple! I'm definitely using your idea and FREEBIE! Thanks for sharing! I love how your anchor charts are always clean and neat- they are great for students who really need to focus on the task at hand! Fantastic! Thanks for the freebie. I have been trying to find a better way to teach summarizing to my 4th grade science class. this will certainly help! Love your checklist! this will help my 3rd graders. Did you also make a checklist for fiction? Thanks! Love this checklist! It will be really helpful as I help my third graders write summaries!! Thanks so much!